Getting started in wedding photography is not as easy as one might think. When I started out, long ago, I had absolutely no idea what I was getting into. I did a lot of research, asked a lot of questions, and I learned. I also wondered how I would ever stand out in the vast sea of wedding photographers. I constantly compared myself to others in the industry – and I learned how to get over that. Now, I am passing on the benefits of what I have learned to other photographers with one-on-one and small group mentoring sessions. 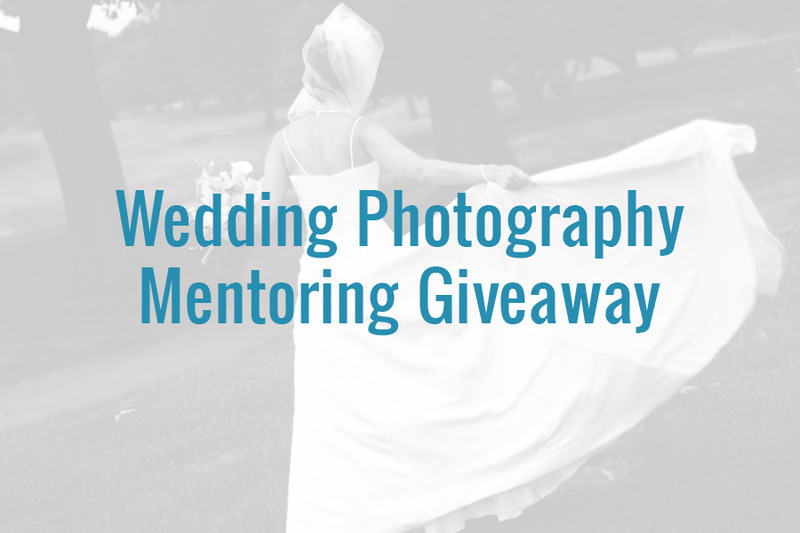 To kick things off, I am offering eight hours of FREE mentoring ($1000 value) to one lucky photographer! 1. Comment on this post below and tell me why you want to learn more about wedding photography. Tell me about your passion and what you want to learn! 2. Go to my Facebook page – like my page, find the entry for the giveaway – like it, and share it with your friends! 3. Sign up for my Photography Newsletter – where you will get photography tips, equipment reviews, information on upcoming workshops, and more. Have your friends comment on my Facebook or Google + post and tag your name, telling me why you deserve to win. See? There are lots of ways to get additional entries. Please do not enter unless you are serious about learning and able to undertake the time commitment. I will be announcing the contest winner on April 1st. I look forward to helping you! If you can’t wait until then and you are interested in booking mentoring sessions immediately, you can find more information on my mentoring page. Remember, the first step to entering is leaving a comment. I adore weddings. Maybe it’s the hopeless romantic in me, but there’s just something about weddings that makes me giddy. The images I have from my own wedding day have the ability to take me right back to that day and that’s something every couple should have. This mentoring session would help me exponentially. I am just getting started on my own after working for a studio and I’m struggling a little with building my business up. I’m confident behind my camera and in the images I produce, but the business side is a new monster to me. I shot my first and only wedding for a friend, last August, and I’m hooked. I ended the day utterly exhausted. The good exhausted – where you can’t feel your feet, your back hurts, your eyes are only open from the caffeine, and yet stopping seems impossible. I love that the couple is so involved in their day that I can capture real moments of happiness and surprise them later. Moments that seemed insignificant are timeless. There are so many emotions on the wedding day that deserve to be documented and held on to forever. I’m not far enough away from my own wedding to forget parts, but I know there were things at the reception that I didn’t see as a bride, but my photographer got for me. I want to give that experience to couples. I believe the photographer has to be just as prepared as the bride, and every couple should be comfortable knowing that their photographer has everything under control. I know I’m just a newbie, but I have the passion and dedication to make it. This would be positively life changing for me and my business. Thank you. Following on Pinterest, Twitter and Instagram as @squishygumibear. Following on Google+ as Heather Springer. Heather Springer has a passion and desire to be a professional photography that is beyond belief…she is one that puts her all behind her desire, a mentoring session would boost her confidence even more. Her photographs are amazing and she can build a wonderful business with the right guidance. Growing up, I and my husband both had a passion for photography, separately, then made it into a hobby together while dating, and then more recently made it into our business as newlyweds. Since we both have other full time professions, we are relying on each other’s strengths, in doing different aspects of shooting a gorgeous wedding and in the every day business aspect as well. Weddings have expectations and childhood dreams, swirling and dancing through the air. I want to add to that dream, be supportive, flexible, invisible, help with stressors with laughter, and assist in making their day perfect. I love being there for the split-second smiles, looks, laughter, once-in-a-lifetime shots, capturing it in time when noone even knew I was there. By the end, I do tear up at least once during every wedding we shoot, as we watch the most authentic display of love and tradition with the couple’s family and friends looking on. Wow, there is much to learn!! I would really appreciate help with marketing, branding ourselves, organization, and those things you have learned that you wished you had learned sooner. Thanks! Hi Casey! I would love this opportunity to be able to learn from you! I have desperately been wanting to second shoot a wedding for a while now so that I can get my feet wet. I am interested in doing wedding photography because it goes along with the type of photography that I would like to specialize in… women. I love making women see their beauty through photography. There’s no better compliment than having a woman tell you she doesn’t feel beautiful, and then seeing your images and having her tell you “Thank you! I didn’t know I could be beautiful”. It’s an amazing feeling! I have been doing photography as a business for a little less than 1 year. I am mostly self taught, but I have recently started taking some classes just to see what else I might be able to learn. Photography has been a passion of mine since I can remember…. making photos with my mom’s Polaroid camera (shaking the picture to make it develop faster). One of my favorite facts about photography is that there is ALWAYS something new to learn, and I LOVE learning new things, new tricks, new ideas. I think I struggle most with marketing. I live on a Marine base and I really want to figure out the best way to branch into the civilian market and to my ideal clientele. I think the would be such a fantastic once in a life time opportunity to be able to learn from you! Thank you for this opportunity! Please contact me with your email address so I can send you some information.